At a juncture of structural crisis, in Spain, there are more and more Catalans who no longer want to be part of this state: today, a country ruled by a corrupt party (The Partido Popular or PP), with a government and a deep state that has not broken with Francoism, of which the monarchy is the faithful representation of this continuity; and this would be added to urbanistic ballots, bank bailouts, austerity policies, high unemployment rates and a lack of guarantees and opportunities. All this is the image and reality of the so-called Regime of ’78; a political framework marked by a pact of silence so that the crimes of the Franco regime did not come to light and were never prosecuted. The remains of Franco were never cleared from the state institutions. It was the time called “Transition” to a democracy that never came and a Constitution that many people have not voted for. Some because we opposed at the time the political reform of Franco, and others because of a mere question of age, since it has been four decades since then. The continuous disgrace and disdain from the high hierarchies of the Spanish state (Government, parliament and Judicature), to the rights historically claimed by the Catalans, with the rejection and mutilation of the autonomy status, continuous sentences of the constitutional court annulling laws of the Catalan parliament has been the mutilation of the Catalan Equality Law, the Catalan Law against energy poverty, the right to housing of the most vulnerable people and to avoid evictions, annulment of the Catalan Anti-Fraud Act, continuous attacks by the judiciary and the central government against the use of the Catalan language in public administrations and education. All this, accompanied by the austerity measures (which the autonomous government applied to cheerfully, using the excuse of the austerity measures being imposed by Madrid and Brussels), was feeding the rise of what was called the Catalan disaffection with Spain. This “disaffection” led to a process of citizen organization from the bases that spread territorially and transversally between the different layers and social classes, leading to to multitudinous citizen mobilizations. From fiscally blocking the accounts of the Generalitat , and de facto suspending Catalan autonomy, leaving it without economic resources. And police: sending the Gaurdia Civil to confiscate ballot papers and other material, for 1-O, arresting public officers, raiding government buildings and deploying almost all riot police squads from across Spain, housing them in old facilities of the State which were in disuse for years, hotels, and in two cruise ships that came to the port of Barcelona. With these repressive actions, the Spanish State has turned a national issue into a civil rights issue by trying to prevent the referendum about the independence of Catalonia at all costs. This strong stance of the Spanish State towards Catalonia shows us its true face: Spain is not a democratic country by prohibiting not only the right of self-determination of peoples, but also the exercise of voting in popular consultations and basic civil and political rights such as freedom of expression and information. The citizens’ response leaves us with a scenario of opportunities for the advance of social movements and the activation of a new cycle of mobilizations at the start of this political course with the possibility of opening a gap in the ’78 regime. If the social movements continue to escalate the conflicts, it is possible to break with this regime and / or the independence of Catalonia. 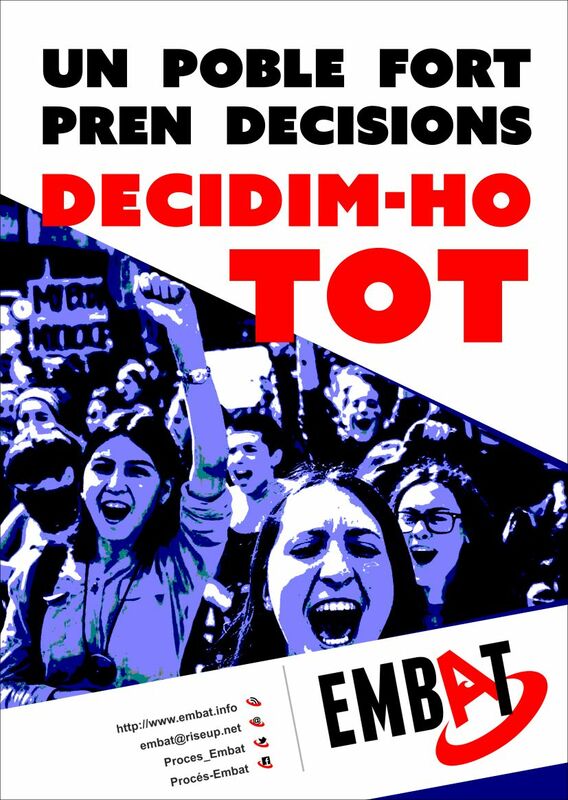 For Embat , it is key to take advantage of this window of opportunity to articulate the popular movement and to take this role not only in the 1-O issue and independence, but also in order to mark an agenda in the establishment of a new political, economic, social and territorial, in matters such as labor / trade union, housing / community, public services / remunicipalizaciones, environment, sovereignty … At the moment, the situation demands both quick answers in the immediate and future actions after 1 -OR. To form, take part or encourage the Committees of Defense of the Referendum (CDR) that have already been created in the towns and neighborhoods, and create them in case that in some neighborhood or town do not already exist and there are people willing to do so. In the notice of the general strike, we will have to count on the unions to guarantee their legality and coverage to the workers who are going to carry it out. Also, the possibility of the general strike materializing would depend on what happened on 1-O. Meetings of various organizations of the popular movement to elaborate a new charter of social rights and establish some lines on we want for the transition towards the Catalan Republic in the issues and areas mentioned above. We also call on Spanish society to mobilize in support of the Catalan people, because not only Catalonia but also the working class in the rest of Spain, which share the same problems as the Catalan working class (both immigrated as a native). In addition, the independence of Catalonia is one of the key points to break with the ’78 regime, since other possibilities such as to take over the government by Podemos, is practically discarded because they have lost almost all of their social base and their discourse is situated in a social-liberal profile, after abandoning the abrupt rupture discourse of its beginnings. Now more than ever, we need to articulate an organized response from the social movements to put the daily problems of the working class on the table and to fight not only for the rupture, but for social, economic and political advances and freedoms. For greater social and economic democracy.